More on the H. Wilson 42 inch Tuffy Presentation Station with White Legs (Various Shelf Colors) WTPSP42E below. 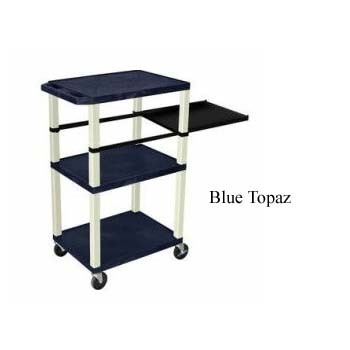 This Audio visual cart includes three shelves that are ideal for presentation equipment such as projectors, laptops, conventional desktop computers, visualizers and document cameras. 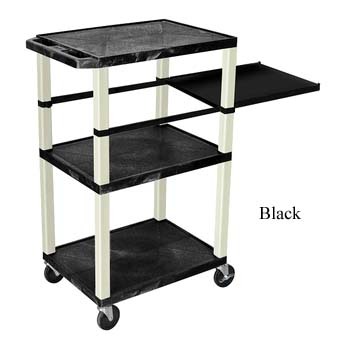 This multi-functional computer cart is constructed from injection molded thermoplastic resin. 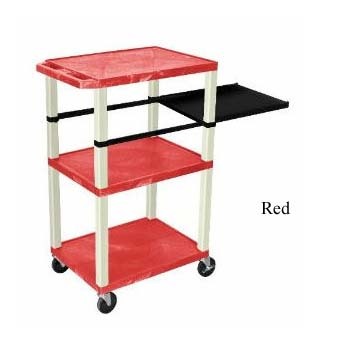 This makes the desk very durable, it will not warp, crack, chip or peel. 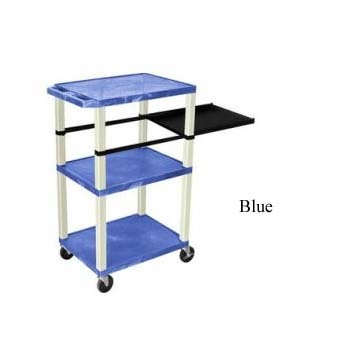 Three 18" x 24" shelves for all presentation materials. 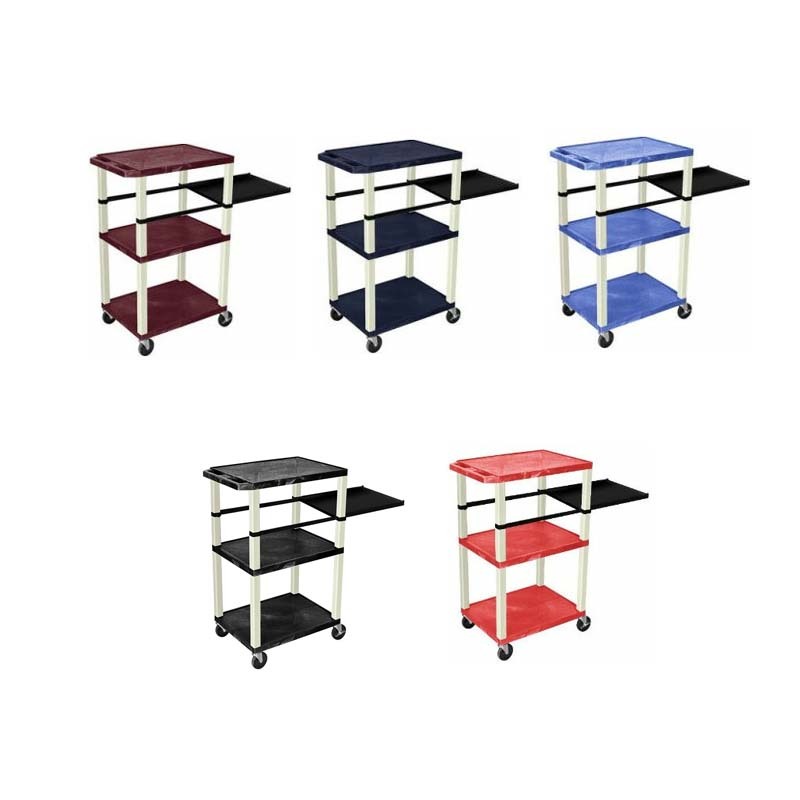 All shelves have a 0.25" safety retaining lip and a raised texture surface to enhance product placement and minimize sliding. Shelves are constructed with a injection molded thermoplastic resin and won't chip, warp, rust, crack, or peel. Cable management access in back panel of cabinet. Keyboard shelf pulls out from the side. 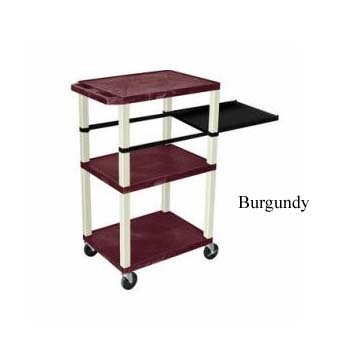 Shelves are available in your choice of colors: black, burgundy, blue, red and blue topaz. A set of silent roll, 4" full swivel ball bearing casters, two with locking brakes. Includes UL approved three outlet electrical assembly with 15 ft. cord and cord management wrap. Electrical attachment is recessed so it doesn't add width to the cart. Comes with H. Wilson's Manufacturers Lifetime Warranty. The pull-out tray measures 19.5"W x 15.75"D.